I have to say that a month of testing is flying past as here I am again with another review of products available from Love Lula. I’ve chosen products with ingredients that are suitable for Vegans. This was another attempt at finding a replacement for my beloved Desert Essence Conditioner and I have to say it’s the closest I have come matching my holy grail. The Madara conditioner is thinner in consistency but I’m getting the bounce and softness I desire. I’m also not getting the second day lanky hair which I have with others. Only minor dislike is it doesn’t detangle wet hair quite as well as Desert Essence. I’m not great at deciding how my colour is lasting as I find my greys are stubborn. 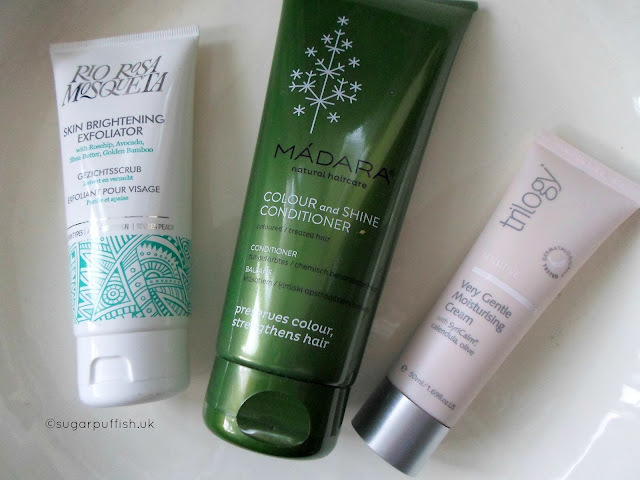 I struggle to hold colour regardless of hair care products. Desert Essence does give me better ml for ml value but Madara is easily available in the UK. Would I replace? – Yes, I'm happy to continue using this conditioner. As the name suggests the “Very Gentle” range is formulated for sensitive and easily irritated skin. No essential oils is a win for me as I'm avoiding linalool. Truthfully I’m totally hooked on this moisturiser as it ticks all the boxes and makes my skin feel wonderful. This Trilogy moisturiser is ideal for dry skin types as the texture feels heavy enough to be effective but without the greasiness. It hasn’t triggered my dermatitis and I’ve noticed improvement in redness. Would I replace? Yes, normally I use oils but I’m enjoying this change to my routine. As a side note I’d like to mention that both Trilogy and Rio Rosa Mosqueta state on their packaging “Against Animal Testing” this is something that would normally have me raise an eyebrow. Madara do not make any reference on their packaging but they are ECOCERT and claim not to test on animals. Certification is always preferable and makes it easier for a consumer to recognise. The statement “Against Animal Testing” needs clarification to ensure it meets your own personal standards so please visit the websites (Trilogy, Rio Rosa) or contact the brands. I had déjà vu about Rio Rosa and delved into my email archives and sure enough I had questioned them back in 2014 about the vague policy but can’t find or recall a response. I’m not suggesting these brands have done anything wrong, it has just made me stop and think that I need to question things more often and I’ve got into bad habits. If you missed my last LL review you can read it here - Mini Reviews January 2017.